recommended for: Fans of Jane Austen, historical romance, steampunk, mystery, murder, or mayhem. People looking for intelligent female characters and realistic romance. Fans of The Unnaturals by Tiffany Trent or Etiquette and Espionage by Gail Carriger. I came across A Dark Unwinding on Netgalley by chance, really. I'd never heard of it before, but the idea of a steampunk Victorian romance with elements of mystery really drew me. I was hooked. 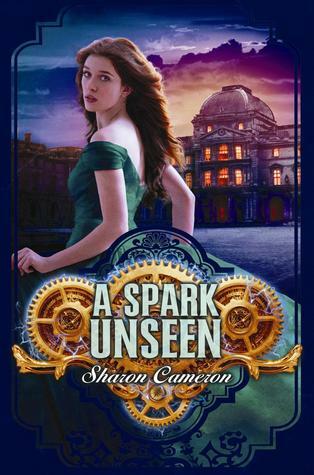 I still consider the first book one of my favorite books of the year, and A Spark Unseen certainly lived up to its predecessor. There's no slow opening; on the first page, you're thrown into the action. The tension just escalates from there and hardly lets up. It feels like the stakes are raised on every page. I won't spoil it for those who haven't read the first, but there are plenty of surprises, with dead men returning, secrets revealed. Everyone seems to have a secret and no one is what they seem. I felt like the book was playing cat-and-mouse with me, and it was fun. Like a puzzle. I loved the return of Katherine, who's a fabulously dynamic character. Her maid, Mary, also plays a bigger role in this book. It's fantastic to see two women taking control in a male-driven world and being effective, clever, and useful. Even when some of the male characters join forces, Katherine refuses to let them shove her aside. I also adore how Cameron mixes history with fiction, creating characters of Napoleon III and empress Eugenie to add an extra layer of intrigue. The writing is gorgeous as well, and totally period-appropriate. Even though the ending was satisfying and sweet, I'm secretly crossing my fingers for a sequel. I love living in the clockworld world of Stranwyne and Katherine. The characters feel like friends. If you can't tell by how much I've written about it, I love this book. I'll start by saying that I knocked off half a point because I think the plot got a little complicated in places. There were some subplots that didn't seemed weirdly coincidental or just didn't serve enough of a purpose to merit page-time. And that's all I really have to whine about. Cameron has a mastery of pacing that's essential for a good mystery. The plot starts explosively with an attempt on Uncle Tully's life, setting in motion a race against time. Hide Uncle Tully, or risk him being used as a weapon--by either side of the war. Katherine's reaction seems a bit extreme, but it tells you a lot about how devoted she is to Tully. She doesn't want him used against his will; she wants to protect him, let him live the life he wants. So then we're dragged off to France--to hide, and to search for some lost people. But the problems have only followed them there and become worse. What I loved most was that there were so many secrets. Every character had one, and Cameron was amazing at revealing just enough at each moment to tease you along, lead you in wrong directions, and surprise you. The final twist had me having a mini giddy freakout on my couch. Even though there were loose ends, the ending was satisfying in itself. I just can't emphasize enough how good Cameron is at piecing an exciting plot together. Never a dull moment, hardly ever a useless word. There's no good and evil in this book. That's something that really appeals to me. The villains have many layers to them. The secret weapon is not a gun or magical orb, but an idea. It's a very profound way to go, and very different from some historical fiction I've read before. It's about the lengths people will go for power and victory, and the lengths others will go to protect the ones they love. It's Victorian, but there are also plenty of steampunk elements like clockwork and early electricity that make it feel magical. And for those who usually shy away from Historical stuff, yes there are real characters and real events, but you don't have to be a history buff to understand what's going on. Most of it is mystery and suspense and romance, with the history just adding a nice context. I love Katherine! She feels so much more unique than many other heroines. She's not just your typical "strong" woman. Her voice feels totally unique, which is helped by her Victorian style of talking. She's also a product of her environment. She's proper. She likes dresses and nice clothes. She doesn't have a huge gung-ho Fight the Man! attitude. But she's also clever, effective, determined, and loving. Even when she feels insecure and longs for Lane's guidance, she's able to push through and take control herself. And she keeps her chin up in the face of the most frightening foes. Then there's Mary, the maid, who's feisty and chatty but also a little vulnerable. Some of the characters, like the Duponts and the Miss Mortimers, feel a little superfluous, but they're more scenery anyway. They create a world that feels real and rich. Then there are some dashing Oscar Wilde-like heroes and some slightly-psychotic villains with their own insecurities. Everyone has layers! Beautiful beautiful beautiful beautiful. Seriously, I love Cameron's writing style. It's Victorian in a sort of Jane Austen way but much more smoothed out, so it doesn't feel too hard for modern readers. It's not overly ornate, that is. Instead, it's lyrical, richly descriptive, and full of unique voices. Perfect pacing, breakneck but with enough lulls to put you in a false sense of security. The end just races up on you. I had such a hard time putting it down, even though I was supposed to be doing homework and hanging out with my boyfriend. It's also highly polished. A young adult historical romance rich with mystery, intrigue, and characters that will stick with you and make you fall in love.